OnePlus 6 has started started receiving its OxygenOS 9.0.3 update. The new update brings the December 2018 Android security patch. OnePlus has also improved some of the preloaded features through the latest software update. The OxygenOS 9.0.3 update for the OnePlus 6 is notably rolling out as an incremental over-the-air (OTA) package, which means it will arrive for a few users before being more broadly rolled out. It comes months after the smartphone received OxygenOS Open Beta 7 that brought OnePlus Roaming. The service brings the ability to surf the Web while travelling in a foreign country without requiring a local SIM card. According to the official changelog posted by OnePlus on its forums, the OxygenOS 9.0.3 update for the OnePlus 6 brings a list of system-level improvements. The update improves Wi-Fi and Bluetooth stability to enhance the connectivity experience on the OnePlus 6. Also, there is the December 2018 Android security patch. The December 2018 security patch notably fixes a list of vulnerabilities behind the scenes. It initially arrived for Google Pixel and Nexus devices and reached the OnePlus 6T last month. Aside from the new security patch, the OxygenOS 9.0.3 update for the OnePlus 6 improves the Nightscape mode. The feature that comes preloaded on the OnePlus 6T arrived on the OnePlus 6 in early November last year - with an aim to deliver an enhanced low-light image quality experience. The latest OxygenOS update for the OnePlus 6 also improves its slow-motion performance and optimises image processing. The update also brings an audio tuner for Bluetooth headphones. There is also support for VoLTE specifically for users on Bouygues FR network. Besides, the update includes general bug fixes and improvements. 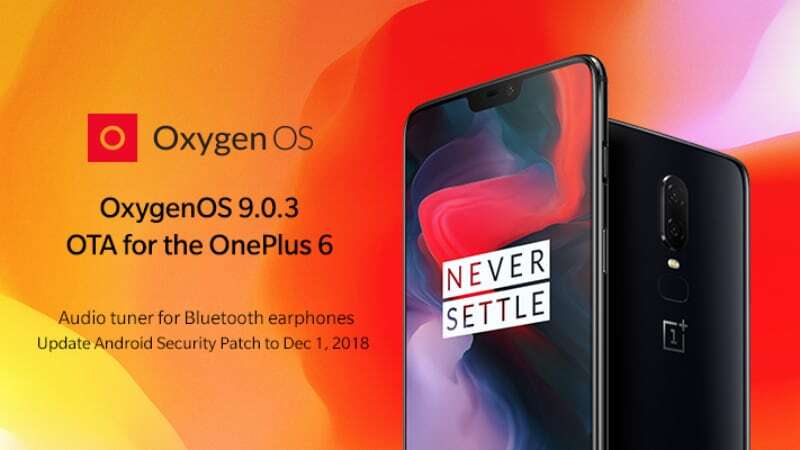 OnePlus confirms that just like previous its versions, the OxygenOS 9.0.3 update for the OnePlus 6 is rolling out as an incremental update. "As always, this OTA will be incremental. The OTA will reach a small percentage of users today, and we'll begin in a broader rollout in a few days," the company said in its forum post. You can manually check the availability of OxygenOS 9.0.3 update on your OnePlus 6 by going to Settings > System > Software updates. You are also recommended to back up your data before proceeding with the update process. As we mentioned, prior to the latest update, OnePlus 6 received a OnePlus Roaming service through the OxygenOS Open Beta 7. The service enabled users to access the Internet in a foreign country without using a local SIM network.